2012/2013 clinical trial is now completed and ready to be published. The results are positive and show Pet Remedy does have a positive influence in relaxing stressed dogs. The study was carried out in 2013 on 28 stressed dogs and involved replicated, repeated, placebo controlled, double-blind tests, and heart rate monitoring. The trial pitted Pet Remedy against the carrier agent for the product (obtained from an independent supplier) as a control. Focal animals received each treatment (control vs. active product) in randomized orders for a standardized time period with a gap between treatments of several days. Focal animals were filmed and their responses observed and scored by a researcher naïve to which treatment had been applied. They concentrated on dogs that had been diagnosed as ‘stressed’ by vets to maximize the chance of detecting an effect. In this three-month long study, dogs with behavioural issues underwent a behavioural modification programme and alternately received Pet Remedy treatment and a placebo. Dogs on Pet Remedy in the first month were switched to placebo in the second month and then back to Pet Remedy in the final month, and vice-versa. The results of the trial are summarised below. As the dogs did not consistently receive the same treatment throughout the study, it is not possible to directly attribute the observed effects to the study treatment received in each month, however the results are consistent with Pet Remedy being an effective treatment. A general improvement in behaviour and excitement levels across the three months was observed. Between the first and second months, there was strong evidence of a difference in the average change in the behaviour scores and excitement levels for dogs on Pet remedy versus placebo in the second month. The majority of dogs on Pet Remedy in the second month saw an improvement in their behaviour and excitement levels compared with no evidence of a change for dogs on placebo. A highly statistically significant difference was also observed between the second and third months, with dogs on Pet Remedy in the third month having an improvement and dogs on placebo in the third month having a small decrease in both their behaviour scores and excitement levels on average. Looking across the entire period of the trial, dogs on Pet Remedy in the final month saw a greater improvement in their behaviour scores and excitement levels between the first and final month, on average, compared with dogs on placebo in the final month. In this three-month long study, 66 dogs with behavioural issues underwent a behavioural modification programme and received either Pet Remedy treatment or a placebo, by random assignment. The dogs remained on the same treatment throughout the study. A general improvement in behaviour and decrease in excitement levels across the three months was observed. Highly statistically significant differences were observed between dogs on Pet Remedy and those on placebo. A greater improvement from baseline was seen for dogs on Pet Remedy compared with placebo after one, two and three months of follow-up, for both behaviour scores and excitement levels. The results are consistent with Pet Remedy being an effective treatment. Sample size calculations were performed to estimate the likely numbers of dogs that were needed in the study to be able to show a statistically significant difference between Pet Remedy and the placebo treatments (in combination with behavioural therapy) in improving the dogs’ behaviour and excitement levels. Sixty-six dogs were recruited to the study and these were of varying breeds, ages, genders, etc. To avoid any issues with potential handler effects that could bias the study results, only one dog per handler was included in the study. Each month, there were multiple occasions where the dogs received the placebo or Pet Remedy treatment and attended sessions with the trainers at the Animal Behaviour Centre (with continued work being carried out by their owners at home). At each session, the dogs worked through various set-exercises (including, for example, hand feeding, and door manners) plus additional dog-specific exercises according to their behavioural therapy, as appropriate. Working with several big rescue centres and involves replicated, repeated, placebo controlled, double-blind tests, and faecal cortisol testing though Chester Zoo. Designed and directed by Kate Mallatratt, who is a Dog Behaviourist and Trainer, www.contemplatingcanines.com and Select Statistics in Exeter http://select-statistics.co.uk/ who helped design the study and analyse the data. The study is a survey of professional dog groomers regarding their experiences with using Pet Remedy on dogs in their salons. 242 dogs were assessed in all, with nearly a quarter of breeds being from the utility group. Of the 70 groomers who trialled Pet Remedy in their grooming salons and provided completed questionnaires, 96% said they would recommend Pet Remedy. Specifically they reported an improvement in common problems, for instance, 61% of dogs who disliked having their paws touched for nails clipping were relaxed for this aspect of the groom with Pet Remedy. With regards to noise phobias to clippers or scissors, 59% of dogs showed an improvement. 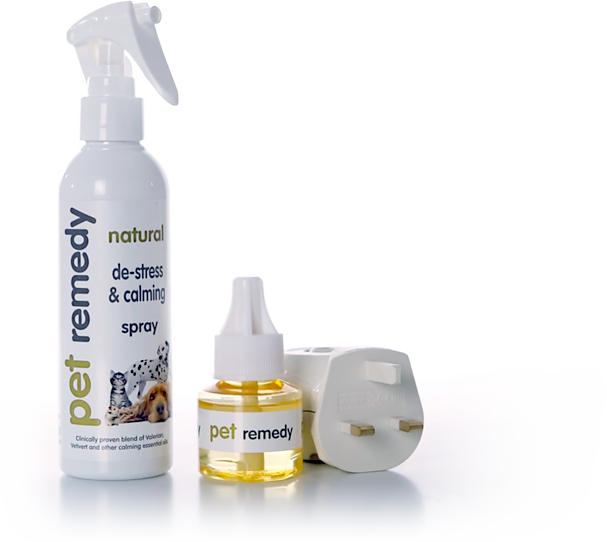 Overall, 80% of dogs were reported to have significantly or moderately improved their behaviour when Pet Remedy was sprayed on the grooming table and a plug-in diffuser was used. The opinions of the groomers are subjective and there was no control group included in the study, however the overall the results appear very positive. Considering the many challenges facing dogs who are being groomed, such as loud noises, unfamiliar restraint and close handling procedures, this product enables most dogs to cope better and adapt more readily to the grooming salon environment and is highly recommended to help minimise stress and anxiety.